Jorge, how did you become involved in organizing meetups around Flutter? When I see a group of people that I admire, I want to be part of that energy. I moved to the USA to finish my Engineering degree (I’m originally from Madrid, Spain), and as a software developer, I quickly discovered the local GDG and Android community. I started attending meetups and saw other developers sharing their knowledge. That inspired me to become a speaker myself and think about starting a community on my own. I used to work for a consulting company before my current job at BMW and had great mentors there. One of them, David Kinney, was organizing a conference in Chicago, SecondConf, and this was another opportunity to meet inspiring people. Why did you feel like you wanted to start an independent community? I’ve been an Android developer for a while and the community is obviously very experienced and mature. It’s great, because you can learn a lot from people who are far ahead of you. This can, however, be overwhelming when you want to be actively involved, because you might feel like you have nothing to say or contribute. I definitely did feel like that for a while. My mentality changed the more I got involved and saw that a community is rich because the experience of its members is rich and diverse. Why did you choose Flutter? I started using Flutter for my own projects and saw great potential to start a community around it. Of course, I had no idea how to do it. In 2017, I was speaking at DroidCon New York and met some people from Flutter NYC who encouraged me to give it a try. 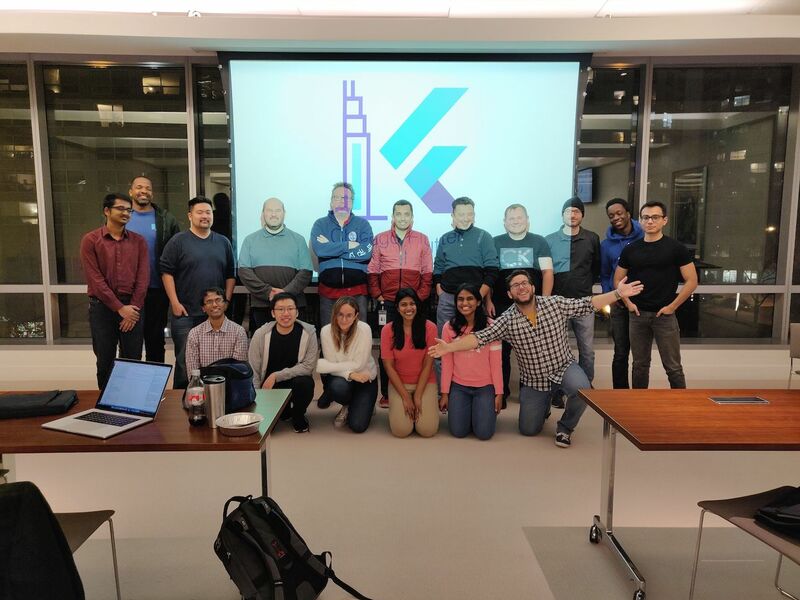 I used my GDG Chicago contacts and with some initial help from them we organized our first Flutter study jam. The timing was just right as Flutter release had been announced at Google I/O and a lot of developers wanted to try it out. Developers generally have a hard time to find time (laugh), but by joining a study jam they can socialize and learn together. We have now a community of ~200 people (~50 people per meetup). I’m optimistic about our growth, because I see a lot of developers, especially students, coming up to me asking how they can be involved. We started a Slack channel to help the community to stay in touch outside of meetups. We share our resources on GitHub and I get a lot of positive feedback on how open and transparent we are. It makes people feel more included, even if they can’t make it to an event. You said that you had good mentors. Would you say that this has helped you overcome some initial doubts about being able to lead a community of your own? I can speak only for myself, but being a young developer it meant a lot to have experienced people around me that coached me. Their guidance and leadership shaped how I now try to work with other people in the community and in my job. I want to motivate them to look for opportunities to grow and realize that there are people that can enable to make that happen for them. What makes a good mentor based on your experience? I think a good mentor recognizes your personality and acknowledges that people need different approaches to self-development. A mentor is there to support you to grow. Not only as a professional, but as a person. Did being part of a developer community help you professionally? Of course. You get to know a lot of people at meetups, you’re building a network of contacts. You interact with each other while building something together. That makes me truly happy and this positive influence transcends to my work and private life. When you start to speak at events, you’re improving your social skills. I had to overcome some initial fears of speaking in front of people in English, which is not my native language. I felt I was being appreciated and supported by other members for just trying, and naturally became more confident over time. Believe me, experiences like this might even change your life (laugh). Is there someone helping you run the community? Well, I’m lucky that my employer supports my community activities with providing space and some snacks for meetups. I have my colleagues helping with event organization. Running the actual meetups is up to me for now. Why do you think your employer supports your community activities? Because I’m very persuasive (laugh). Seriously, being active is appreciated here and if you build a case, you can find support. BMW has been supporting tech events and conferences to showcase the interest in technology and community building (which is one of the company’s values). The vehicle industry has been changing a lot in the recent years and BMW wants to lead these technology change efforts. How do you find balance between your organizer's life, work and other things you have going on? Maybe it’s just me, but I don’t see most of the things I’m involved in as an obligation. I’m enjoying my work and everything around it too. I know it’s a challenge for a lot of people to find what they’d like to focus on, but that’s not my case. I have very supportive family and friends. They’re willing to help if needed because they see it is of great importance to me. That’s great to hear. However, there will soon come the time when you’ll need help running the community. How are you preparing for this? Totally. I’m taking it step by step and there are a lot of things that I haven’t figured out yet. I’m not afraid to ask for help if needed. Jorge, what part of the community organizing do you enjoy the most and the least? When I was younger, learning about technologies was most interesting and attractive. The more experienced as a developer I become, I see a lot of value in learning about human interactions and creating a healthy and open community environment. I understand the need for management and reporting, but these bits are not my favorite. Sometimes, when you bring a group of people together, interactions are not always positive and helpful. The idea of having toxic interactions among members worries me and I try hard to prevent it. I want to learn as much from other organizers as possible. As I said before, I’m super open and transparent and not afraid to ask questions. If I need advice or get feedback, I turn to my mentors. I work closely with the Google Flutter team, and their approach to community building is very inspiring. So it’s a mix of resources and people. What do you wish you had known before starting as a community organizer? I naturally would like to please everyone and that’s impossible. Feedback from your audience is important, but people will often tell you contradictory things. You have to have your ultimate and clearly defined goal in mind and be prepared that it will take time and patience to achieve it. Jorge, what are you looking forward to in the future? I am so excited to organize events around Flutter, maybe a hackathon. I want to engage more members to be active in organizing meetups and speaking. On a personal level, I’m just super grateful to be part of this amazing community of people around Flutter and other technologies.